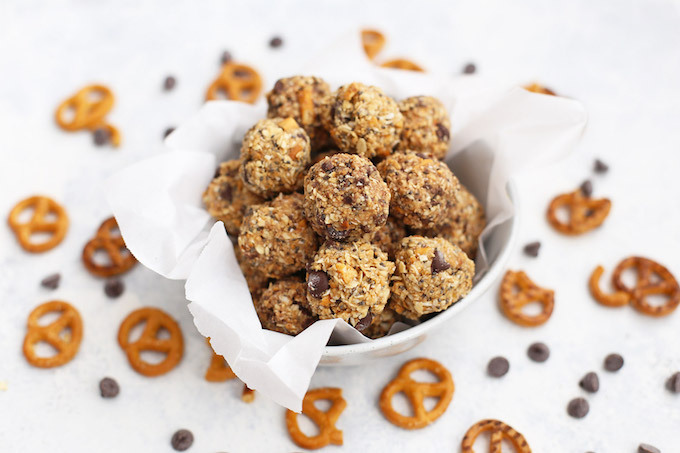 Sweet and Salty Peanut Butter Pretzel Energy Bites – These little energy bites blur the lines between snack and treat. The perfect blend of salty and sweet, they’re one of my favorites! This is our second week of fall break, and I’ve found myself really craving the cozy comfort of the season. It’s still well into the 90s on a regular basis, so sweaters and boots and steaming cups of cocoa are still mostly something I’m dreaming about, but the feeling? The feeling is something I’ve been capturing as much as I can. We turn the lights lower in the evenings, playing soft music and turning to cozy kitchen favorites, like simmering pasta sauce or freshly-baked cookies. On my morning walks, the sky is darker and the stars wink at me a little longer than usual. Even Sophie and Milo are feeling the cozy pull, and Sophie’s been begging to get in the kitchen more often with me. She loves to stand at the stove (supervised), stirring scrambled eggs or spreading jam on toast in the mornings, and she’s been asking to try other things lately. Baking is one of those things that lends itself beautifully to working with kids. It’s a royal mess, but the process and end result are so delicious that everyone tends to try just a little bit harder when it comes to baking projects and sweet treats. Since we can’t bake 12 dozen batches of cookies a week, I’ve been getting creative. Sophie’s helping me do things like making a fruit plate to go with dinner, or packing lunches, or working on no-bake energy bites for snacks throughout the week. 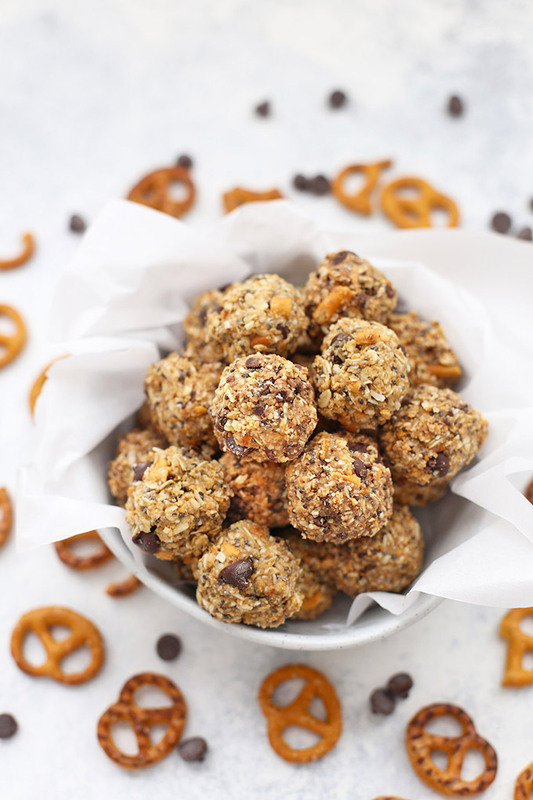 These sweet and salty peanut butter pretzel energy bites are one of our current favorites, on repeat as often as my kids will let me make them! We’ve adapted a Pinch of Yum recipe to suit our tastes a little bit better. 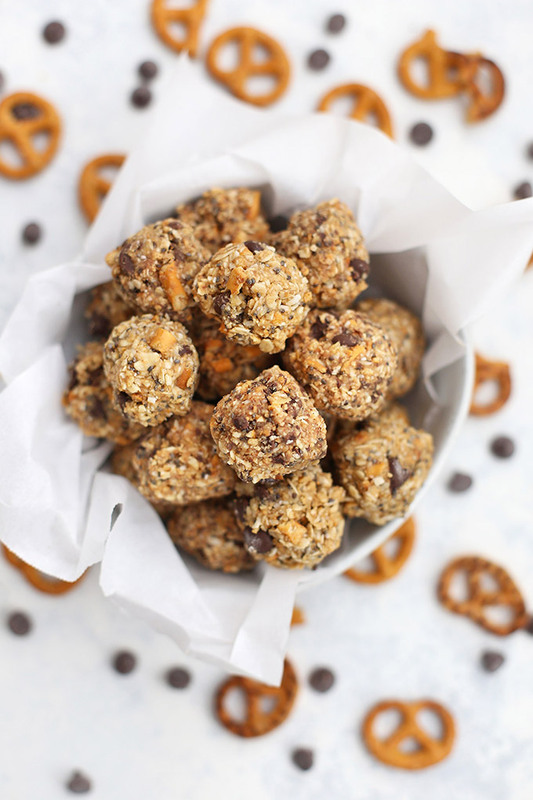 I love the blend of salty pretzels with peanut butter and a few chocolate chips (because #chocolate). I also like that we toss in some healthier ingredients like rolled oats and chia seeds. They’re just right and really blur the line between treat and snack. Milo’s in the middle of a big growth spurt so having a snack already prepared has been a lifesaver. I can add one to his lunch, or easily pull them out to go with a smoothie or some fruit for an afternoon snack. Aaaaand I’d be lying if I said I hadn’t snuck one or two from the refrigerator when my sweet tooth comes a-calling. They’re just that good. 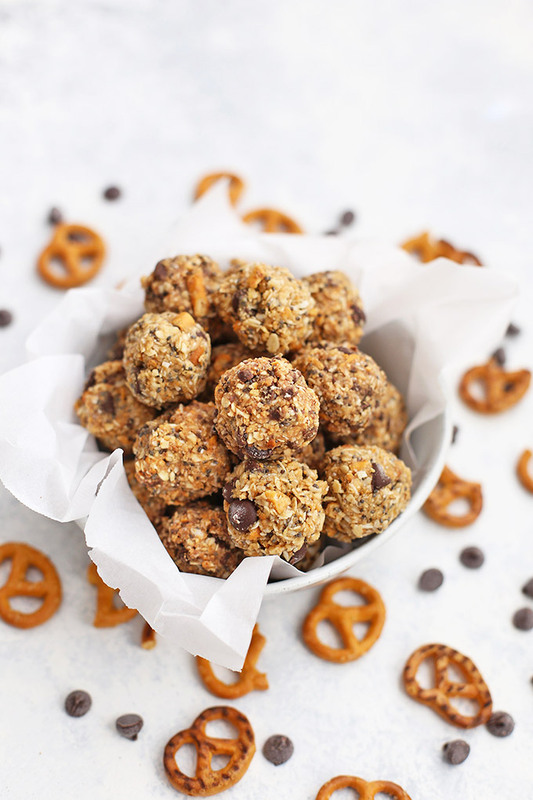 Peanut Butter Pretzel Energy Bites are a perfect meal-prep snack or treat that we all feel happy about. So make a batch. I think you’ll love them as much as we do. A note on getting the right texture. A food processor or blender really comes in handy here for pulsing the pretzels and oats a bit. You’re looking for a crunched up (but not completely pulverized) texture so that you still get some crunch from the pretzels. If you don’t have a food processer/blender, you can still make them. Put the pretzels and oats in a large zip-top bag and crunch them up using a rolling pin or the bottom of a cup. If you find your energy bites are a little too wet, add a few more pretzels. If they’re too dry, you can add a little more coconut oil or syrup. Let’s talk gluten free. I make these gluten free by using gluten free pretzels and certified gluten free oats. If you’re not GF, you can absolutely use the traditional versions. Can I use a different nut butter? Yes! Do know that the nut butter is a primary flavor ingredient, so be sure to use one you like. I’ve tried them with almond butter and Nuttzo (a mixed nut and seed butter I really like). I think cashew butter and sunflower seed butter would also work like a charm. Can I substitute….? Probably yes. You can use flax instead of chia seeds, or extra oats instead of coconut. You can swap out the syrup for honey or agave, and the peanut butter for whatever nut or seed butter you like. I just recommend keeping the ratios of wet and dry ingredients more or less the same so they’re not too dry. What’s the best way to store them? I always keep them in the refrigerator in an airtight container or zip-top bag. They’ll keep in the fridge for about a week. You can keep them about a month or so in the freezer if you prefer. 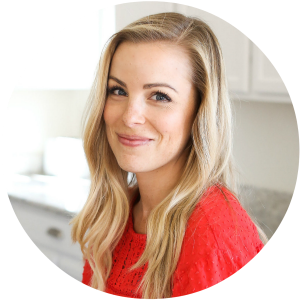 Meal Prep in Minutes – all my tips for meal prep without a lot of time or effort! In a blender or food processor, pulse pretzels and oats 4-5 times (just enough to break them up. Not enough to turn them to flour). If you don’t have a food processer/blender, you can still make them. Put the pretzels and oats in a large zip-top bag and crunch them up using a rolling pin or the bottom of a cup. In a medium bowl, stir together peanut butter, syrup, coconut oil, chia seeds, and vanilla. Fold in pretzel/oat mixture, coconut, and chocolate chips. Stir until mixture is well combined. If mixture is a little dry, add a bit more syrup or coconut oil. If mixture feels a little too wet to handle, add a bit more coconut or crunched pretzels. Roll into 1″ balls (I usually get around 20-25 balls). Place on a plate lined with parchment paper. Refrigerate until no longer tacky (about 10-15 minutes), then transfer to an airtight container or zip-top bag. Store in the refrigerator up to 1 week, or the freezer about 1 month. Yum! These look amazing! I love the sweet and salty combo! Shirley – I’m not sure what your question is, but I’d love to help. There’s no butter in the recipe, so I’m assuming you mean the weight of the peanut butter? I’m not familiar with metric measurements, but a quick Google search says that 1/2 cup peanut butter is approximately 125 grams. I hope that helps! Love these! Curious- was your peanut butter salted? Mine were made with no salt peanut butter so I added a touch of salt to the mix. Delicious! Michelle – Mine only has peanuts and salt as ingredients, so yes! I didn’t even think about that, so thank you of pointing that out! I bet that pinch of salt made all the difference with unsalted peanut butter! I doubled the recipe and brought it to a potluck – absolute hit! Didn’t change a thing other than using mini chocolate chips. I’d make this recipe again!